Written and directed by Jean-Luc Godard, Sympathy for the Devil (One Plus One) is a documentary film about the recording of the titular song by the Rolling Stones that is inter-cut with segments relating to the political and social events of the late 1960s. The film marks the beginning of a period of experimental features for Godard in his movement away from traditional narrative while he chronicles one of the most popular bands at that time during a crucial period in their career. The result is a fascinating though uneven film from Jean-Luc Godard. The film follows a series of recording sessions in June of 1968 by the Rolling Stones for a song that is to reflect into the chaos of that year entitled Sympathy for the Devil. During the course of the film as the Stones would try and create this song, the film would be inter-cut with dramatic segments featuring actors reading or giving their views on many social and political ideologies of the time. Yet, both narratives would often feature a brief jump-cut of someone spray painting political slogans all over London during the course of the film. It’s a film that has two very different things happening yet both segments would also feature commentaries by a narrator (the voice of Sean Lynch) reading stories on Marxism where it would often drown out some of the things that is happening or be drowned out by comments from those talking politics or the Stones playing music as well as sounds of jets flying in the air courtesy of sound mixers Derek Ball and Arthur Bradburn. Both the segments involving the Stones and the political content are shot in long takes by Jean-Luc Godard with the aid of cinematographer Anthony B. Richmond as it follows not just what is going on but also in the environment. Whereas the Stones are seen recording at Olympic Studios in London, the political segments largely take place in different areas. There’s two different segments involving black militants talking about their own ideas while executing white women in one segment as it takes place in a junkyard near a river. A segment with actress Anne Wiazemsky as a character talking to people in the forest about what she thinks the state of the world and the different ideas of politics. There’s one segment taking place inside a bookstore where a Fascist reads a book on Fascism with two customers beaten and bloodied by other Fascist customers as the store is surrounded by comics, pulp novels, and nudie magazines. 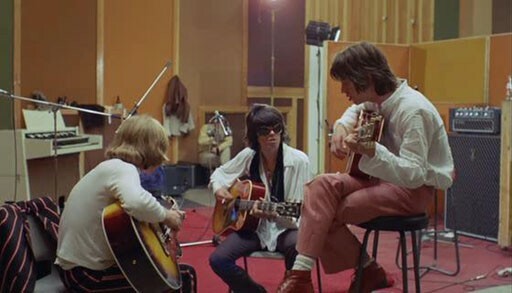 The scenes involving the Stones recording Sympathy for the Devil shows the band hard at work trying to develop the song that would become one of their defining songs as vocalist Mick Jagger tries to find the right vocal tone for the song while guitarist Keith Richards would play bass on the song trying to find its groove. Drummer Charlie Watts and bassist Bill Wyman would provide their own contributions to the song as would session keyboardist Nicky Hopkins and producer Jimmy Miller. The scenes also showcase guitarist Brian Jones becoming less involved as there’s a major scene during the recording where the band plus Hopkins and percussionist Rocky Dijon are all playing in the circle while Jones is playing acoustic guitar in a booth behind Jagger. It is a moment that shows his diminishing role in the band as he would die more than a year after the recording of the song. While the film does contain some rich cinematography by Richmond as well as some straightforward editing by Ken Rowes including the jump-cuts to showcase the young woman spray-painting slogans on walls around London. The film is definitely uneven largely due to the fact that Godard wants to create something that is a response to the events of 1968 as it’s really 2 different films. Yet, the film’s original intentions had Godard wanting to make something that is more political but clashes with one of the film’s producers in Iain Quarrier, who plays the role of a Fascist book seller, would complicate things as the resulting film that is shown is quite uneven. It’s uneven to audiences that thought they would see a film about the Stones in their prime only to see something else while Godard-enthusiasts would wonder why the Stones in a film that definitely has a lot of commentaries on the politics of the times. Sympathy for the Devil (One Plus One) is a stellar film from Jean-Luc Godard. Though it’s a very uneven film due to its different subject matter. It is still an interesting film that chronicles a tumultuous time period inspired by the events of 1968 as well as a look into the Rolling Stones creating one of their defining songs. In the end, Sympathy for the Devil (One Plus One) is a terrific film from Jean-Luc Godard.